Though headline accompanying a Guardian article by Kareem Shaheen (Dozens of fleeing Syrians turned away from Israeli border, July 17th) is accurate, the author egregiously misleads readers by suggesting that Israel has done little to ease the suffering of Syrian victims of the seven year civil war. Israel has said it will not allow any refugees to cross the border, despite urgent calls by humanitarian agencies saying their safety is at risk. They are trapped between the Israeli border and advancing regime forces with little shelter from the harsh summer weather. The intensity of the bombardment was such that dozens sought refuge in Israel despite the country’s status as an archenemy of Syria. Israel has on occasion allowed individual civilians and fighters with life-threatening injuries to be treated in its hospitals. To claim that Israel has treated injured Syrians only “on occasion” is extraordinarily misleading – concerns we tweeted to the Guardian journalist. In fact, Israeli doctors have treated more than 4,800 Syrians (including 600 children) in field hospitals on the border and in public Israeli hospitals since 2013. And, contrary to the Guardian’s claim that they’re only treating life threatening wounds, treatment has included reconstructive surgery to treat those disfigured by shrapnel, as well as children with chronic, but not life-threatening, illnesses. Further, Israel is doing more than just providing medical treatment. Their quite massive humanitarian mission in the north, named Operation Good Neighbor, has also included, over the last two years, delivery of more than 1,500 tonnes of food, nearly a million litres of fuel for heating, and 300 tents to the displaced. 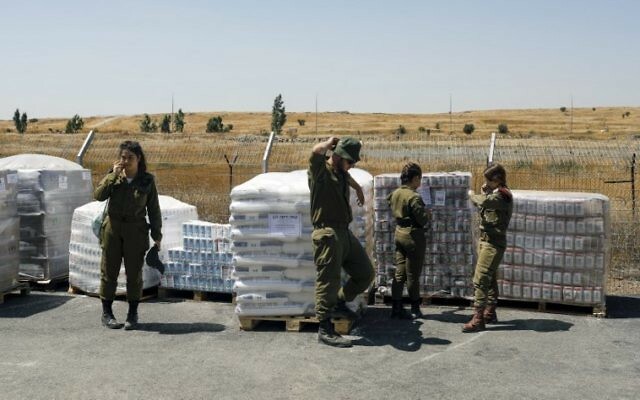 Israeli soldiers stand next to food supplies being prepared for Syrian refugees at an army base in the Israeli-annexed Golan Heights and Syria, on July 19, 2017. And, as the Indy’s new Middle East correspondent recently reported (“Syria conflict: Injured civilians turn to historic foe Israel amid Deraa bloodshed”, July 13) these humanitarian gestures may be paying dividends in terms of Syrian perceptions of Israel. The Indy quoted several Syrians praising Israel for the medical care they received. But, of course, the Guardian is clearly not interested in articles that have the potential to challenge their readers’ prejudices, especially such a counter-intuitive story which offers a glimpse at how Israeli humanitarian efforts, and other gestures of good will, have the potential to win over some hearts and minds in the hostile Arab world. Dave – I don’t see racism. I see a concern by Israel for its safety. I also see an opportunity, if not an obligation, for Israel to help more Syrian refugees. The Jewish people were not welcomed in many lands when they sought refuge from the Nazis. Given that history, I think the Jewish people have a special obligation to help more of the refugees. Perhaps temporary residence in Israel is an option. And by the way, wailing about antisemitism is a justified activity. You made me wail when I read your comment. “Of course. Britajn had given a section of Palestine for them to live in. They chose the name Israel from a list of possibles.” The Balfour Declaration covered what is today both Israel and Jordan. Of course, in typical British fashion they then tried to take it back when it was no longer to their advantage. May all your Jihads turn into personal Nakbas! Fortunately, the British only determine that in their own minds. Davy and Mikey are swinging singers! Sure, it doesn’t rhyme, but these guys aren’t geniuses. They’re simply tools.